The pecan (Carya illinoenensis, family Juglandaceae) is native to the Mississippi floodplain of North America. Pecan trees are not well adapted to withstand hurricane force winds. Ironically, the best maintained trees with thick foliage and a large nut crop approaching late summer are most susceptible to damage as a result of tropical storm or hurricane force winds. A low input pecan variety trial was initiated at the NFREC-Quincy in February 2011. This trial consists of Amling, Caddo, Cape Fear, Curtis, Desirable, Elliot, Excel, Forkert, Gloria Grande, Kanza, Melrose, Moreland, Oconee, Pawnee, Stuart, Sumner, Kiowa. No insecticides or fungicides were applied in 2018. 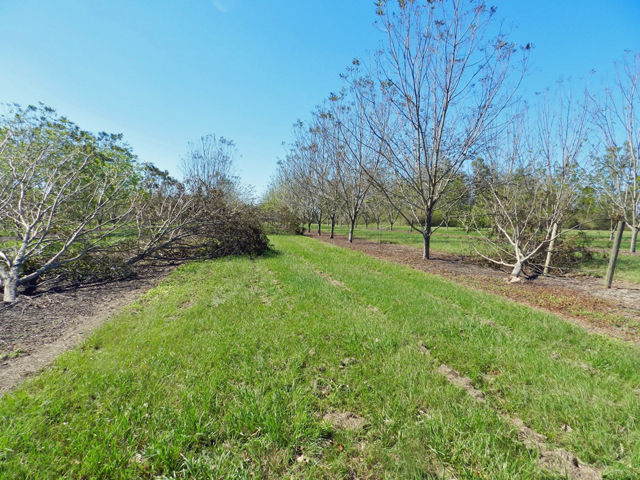 Hurricane Irma had a negative impact on the NFREC-Quincy pecan orchard. Several trees were blown over and many leaves were blown off the trees in response to tropical storm force winds (Table 1). Hurricane Irma produced sustained winds as high as 37 mph at the FAWN measurement center in Quincy, although I suspect that wind gusts were as high as 50 to 60 mph. After Hurricane Irma and the high scab pressure of 2017, the 2018 crop was virtually eliminated at the NFREC-Quincy. Between 0 and 40 % of the trees were blown over by Hurricane Irma. Melrose was the cultivar most impacted by hurricane force winds, whereas all trees of seven cultivars remained upright. One tree each of Caddo, Curtis, Elliott, Gloria Grande, Melrose and Oconee that were blown down to a 45o angle were staked and tied to a vertical position with two posts and wire several weeks after Irma. They remained upright until hurricane Michael blew all of these trees down in a direction not supported by the posts (generally from south to north). Hurricane Michael was far more damaging than Irma, with sustained winds of 55 mph recorded at the Quincy FAWN weather station. I believe that wind gusts on October 10, 2018 were as high as 70 to 85 mph. 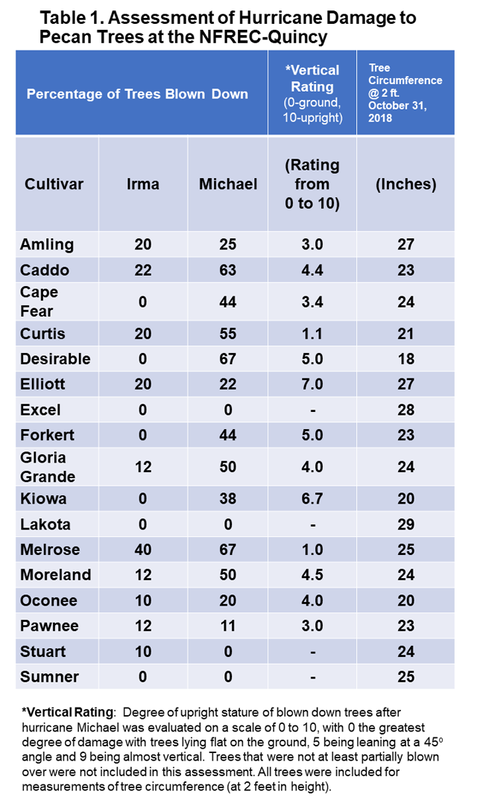 All trees of Excel, Lakota, Stuart and Sumner remained vertical after hurricane Michael (Table 1). At least 44 % of Caddo, Cape Fear, Curtis, Desirable, Forkert, Gloria Grande, Melrose and Moreland were blown over by the storm. Some varieties such as Curtis and Melrose were blown completely over with a broken major root system, whereas Desirable, Elliott, Forkert and Kiowa were leaning at an angle of 45 to 90o. Trunk circumference was usually between 22 to 29 inches (two feet in height). Curtis, Desirable, Kiowa and Oconee were the smallest trees, which I attribute to partial defoliation due to high pecan scab pressure. The three largest diameter trees (Elliott, Excel, Lakota) are all scab resistant cultivars. Incidentally, only two trees of Stuart sustained any significant limb breakage (data not shown). The high frequency of hurricane events that impact regions within 50 miles of the Gulf of Mexico must be taken into account when growing pecan trees. However, what made hurricane Michael particularly devastating to the pecan industry was that category 3 hurricane status was retained into Georgia. This hurricane was probably the most devastating storm to ever impact the center of the pecan industry in Albany, Georgia. The timing was especially bad in that most varieties had not yet been harvested. I would like to share one observation concerning a pecan tree’s tendency to sustain hurricane injury. As mentioned earlier, trees with heavy foliage and a good nut crop will sustain the most wind damage. Another factor to consider is the in-row weed free strip (normally 8 to 12 feet wide). Weed control will increase the efficiency of water and fertilizer use by pecan trees, and is necessary for sweeping nuts at commercial harvest. An unintended consequence of this bare soil is that tree roots cannot be held in place by surrounding vegetation. For example, the roots of bahiagrass (often used in row middles) can extend down to a depth of 3 feet or more. I observed that roots of blown down pecan trees were usually pulled loose from this in-row strip because there was no support from surrounding vegetation. In conclusion, there was a cultivar dependent degree of hurricane injury in the NFREC-Quincy pecan orchard. The most resistant cultivars to blowing over were Excel, Lakota, Stuart and Sumner. The most injury was recorded for Desirable and Melrose. If we are in an era of climate change with a higher frequency of tropical storms and hurricanes, resistance to storm injury should be considered as a criterion when selecting pecan cultivars.